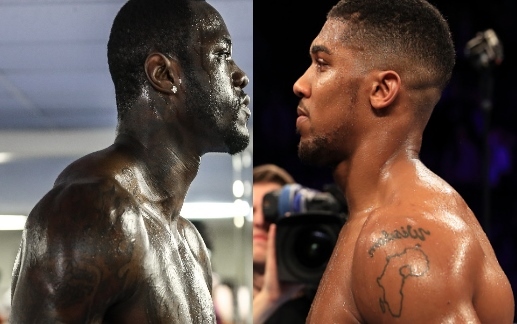 Anthony Joshua: Deontay Wilder Unification "Has To Happen"
Anthony Joshua believes a showdown between himself and WBC heavyweight champion Deontay Wilder is the fight boxing needs. Joshua stopped the teak-tough Carlos Takam in the 10th round at Cardiff's sold-out Principality Stadium on Saturday to retain his WBA, IBO and IBF titles. The gruelling victory, in which Joshua suffered a bloodied nose from an early clash of heads and Takam was cut over both eyes by the time referee Phil Edwards decided he had absorbed enough punishment, kept the 28-year-old on course for a blockbusting 2018. April's dramatic triumph over Wladimir Klitschko at Wembley underlined Joshua's status as boxing's latest superstar and unification fights with WBO king Joseph Parker or Wilder would do big business. But it is motormouth American Wilder, who defends his belt in a return clash against Bermane Stiverne next weekend and boasts 37 stoppages in an unblemished 38-fight record, who appears to pique Joshua's interest above all others. Asked whether Wilder was a fight he needed, the 2012 Olympic gold medallist replied: "Yeah, boxing needs it. One hundred percent." Promoter Eddie Hearn this week mocked Wilder's financial demands for a possible February bout against Joshua's old foe Dillian Whyte. Nevertheless, Joshua believes an agreement could be reached for a contest putting three of the division's four main belts on the line. "It has to happen. We're easy to work with. Eddie knows what he's doing," he said. "Eddie just wants to keep a lid on his [Wilder's] jar and say, 'wow, calm down'. "We can fill it up to the top and maybe spill a little bit over but we're not filling up the second jar." Wilder was quick to launch some preliminary mind-games against Joshua, claiming there were question marks over the champion's stamina as he moved to 20 career wins and knockouts versus Takam. Joshua tipped the scales at a career-high 254-pounds and Wilder, 32, thinks his heavily muscled physique can be more of hindrance than a help over the 12-round championship distance. Joshua's coach Robert McCracken and Hearn see no pressing need to take on Wilder next, with both believing the superfight could be built into a considerably bigger proposition over time. Joshua himself feels Wilder's desire to get a deal done stems from the 2008 Olympic bronze medallist feeling his career is treading water. "He's done 40 fights. He's approached these fights so many times I think he's just desperate [thinking], 'I need a buzz, I need a thrill'," Joshua added. Tired of all the promoter bs! Let the best fight the best when they are at their best.